Meditative healing music with strong Native American overtones await on the soothing new release from flutist Ann Licater. Her gentle arsenal for this outing includes Native American, alto, silver and Peruvian clay flutes, along with “many sound healing instruments.” She’s joined by several musicians, including Jeff Oster on trumpet, Peter Phippen on bass, and Ivar Lunde on piano, and together they craft a lush New Age ride. Fans of Native American flute will find much to like here. Licater weaves the feel into full instrumentals, like the opening track, “Angels on the Wind.” While Licater’s flute sings its song, a cool, shuffling beat works its way in. It’s a nice surprise, and a great offset to what your ear expects. Licater plays with the motif in spots, bending notes or ending long breaths with a sharp whistle. Lis Addison’s vocals bring a nice prayer-chant tone to the mix. But it’s hard to beat the gorgeous simplicity that comes from the pure connection between this artist and her flute; “Oneness” is a clean and simple meditation, a piece that dances like sunlight on water. This track is beautifully recorded, allowing space for the resonance of the flute’s rich tones to echo just lightly. While I do enjoy Licater’s Native American-influenced work, on this release I find I am more fond of the pieces where she explores other vistas, free of the connotations that sound brings. The tone of the NA flute immediately puts me in mind of deep valleys and desert landscapes with circling hawks. On other tracks, my mind is allowed to go where it will, guided by Licater. The title track takes me to the middle of a quiet and very intimate gathering, a commingled conversation between Licater, Phippen and Lunde. I love the informal vibe that courses through “Luminous Awakening.” It feels like the players are carefully listening to each other in a playful call-and-response mode and building on their theme. Ringing tones from Kathleen Farrell’s crystal bowls add a nice touch against the deep, round sounds from Phippen’s bass. “Dream Journey” takes on a slightly jazzy tone, albeit a slow and graceful jazz, with more of Phippen’s bass (did I mention that I enjoy it?) and the crisp sound of steel tongue drum. Although Invitation from Within clocks in at just over 45 minutes, it’s one of those time-stretching bits of work. Relaxing, unimposing, subtly guiding you to a calm and beautiful place, it’s one you’ll want to leave looping at the end of the day. It’s also one to listen to closely to take in the excellent interplay between musicians and the lush production work. 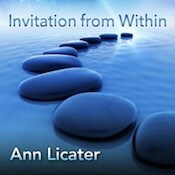 A great release from Ann Licater. New Age fans need to add this to their collection. Available from the artist’s web site.